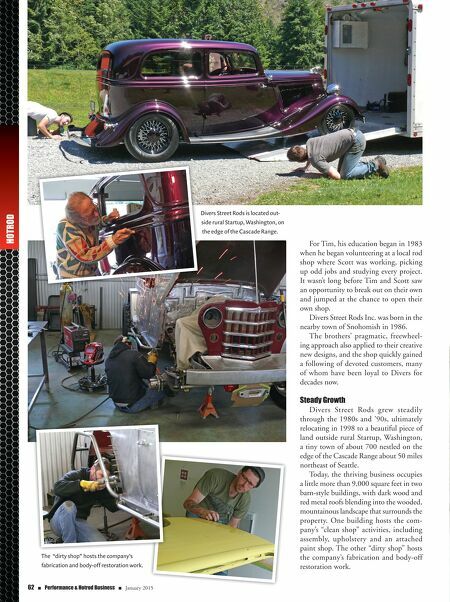 January 2015 n Performance & Hotrod Business n 63 For Tim, who spent plenty of time in the big city when he was younger, playing bass in a band called Prowler, the moun- tain setting of Divers Street Shop is a taste of heaven on earth. From their mountain headquarters, the company employs a tight-knit group of employees, including Tim and Scott as well as Tim's wife, Denise "Diny" Divers and his son, Justin Divers. Nick Lampert, Sig Schott, Jake Strain, Ian Richards and Kevin Gilbert round out the team. Together the small, skilled team can do almost anything related to custom turnkey builds in-house, which is a critical capac- ity, according to Tim. "I learned pretty early on that the more cooks you had in the kitchen, the harder it was to do work that you're proud of," he says. "We like to have all of those capabili- ties in house so we can control the quality of every aspect of our builds. Honesty and responsibility are critical in this business. We always tell the truth and take responsi- bility and that's hard to do when someone other than your team controls a part of the build." Customer Collaboration Divers Street Rods' one-stop-shop approach to doing all elements of a build in-house also lets Tim and the team do what they do best: collaborate directly with customers to create a unique vision for a given project. "I believe there's no wrong way to build a hot rod," says Tim. "Even when you're at car shows featuring some of the best in the business, you may not like the color or the wheels or something else about a builder's style. But it's their thing and their vision, and that's cool. "For me, the chance to share your ideas and blend that with the vision a customer has and then watch as the project comes together, that just makes me feel really good," he says. "Usually they have a vision, we have one, and then we collaborate and come up with something really special." An example of Divers' collaborative approach is on full display in one of Divers Street Rods' highest profile builds called the Ferrambo, which is a mash-up of a Ferrari drivetrain with a 1960 Rambler station wagon. The project, created for close friend and longtime regular customer, Mike Warn, founder of WARN Industries, features a 2002 Ferrari 360 Modena drivetrain and 405HP, 3.6-liter V8. The stunning vehicle, painted classic Ferrari Ross Corsa Red with a tan Scottish leather interior, was styled to take on the appearance of an early Lusso Ferrari. Warn had purchased the Rambler from a mutual close friend of both his and Divers, Craig Lang, who supported the idea of the radical combination of the two vehicles. Not everyone else did, however. "There were some Ferrari purists and Rambler purists who were critical of the project," says Tim. "But Craig loved the idea, which meant a lot to me. Craig, who passed away since, was one of the best peo- ple I've ever known." Thankfully, most fans—and many influential car critics—loved the dynamic project and in March of 2008 the Ferrambo took home the prestigious Don Ridler Memorial Award, one of the most sought-after honors in the hot rod world. Presented each year at the Detroit The small, skilled team can do almost anything related to custom turnkey builds in-house. I learned pretty early on that the more cooks you had in the kitchen, the harder it was to do work that you're proud of.